Posted by Vanessa at 12:14 AM . "A firm foundation is necessary for any building, institution, or individual to endure." Primers are essential to creating the perfect foundation for long-lasting makeup, creating a flawless and smooth canvas before applying your makeup. 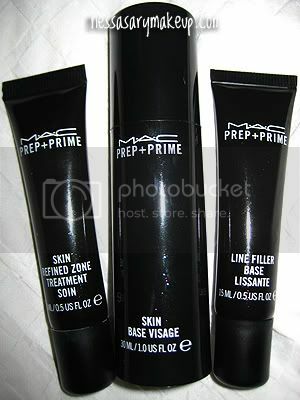 I recently picked up 3 MAC Prep + Prime primers: Face primer (base), Line Filler, and Skin Refined Zone Treatment. The tubes on the Skin Refined Zone Treatment and Line Filler are smaller in person, however a little goes a long way so it should last you a relatively long time. These are also officially part of the PERMANENT LINE in the MAC's Prep + Prime family, so there is no need to rush to nab one as they are definitely here to stay! (I did NOT buy the Prep + Prime Transparent Finishing Powder, I bought the MAC PRO Transparent (invisible) setting powder. The difference? The Prep + Prime one is of a finer grade, meaning the powder itself is more finely milled for a more "soft focus" type look). I will do a review on the PRO powder I bought soon. 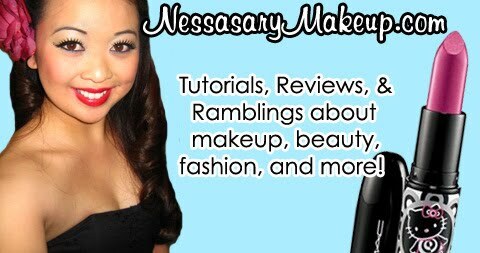 In this post I will talk in depth about each of these primers and its uses, as well as how you can make the most out of them to achieve the perfect look. The Prep + Prime Skin Refined Zone Treatment ($19.50) is described as "A light, oil-free emulsion that helps cloak visible pores while controlling oil and shine. Applies "wet" for a gentle micro-exfoliation: dries instantly to create an invisible, long-lasting natural matte finish. Ideal for the T-zone." Translation: You apply this OVER your moisturizer (let it dry in between), it's supposed to help minimize the look of pores as well as controlling oily areas of the face by absorbing the oils and giving you a shine-free face such as your t-zone area. The consistency is similar to that of a moisturizer except it feels more "thin" rather than thick, when applied to the face (like you would apply your moisturizer), it dries quickly to a nice matte, soft powder-like finish (and feel). Overall: I like this prep + primet, it actually keeps me less-shiny than normal, and I love how I can use this on light or no makeup days to help me achieve a more natural look without looking like an oil slick later on in the day. However I don't feel like it's a "must-have". A good face primer or a mineral transparent powder such as Purely Cosmetics' Oil Absorb or Silk Primer are awesome alternative choices for oil control throughout the day. 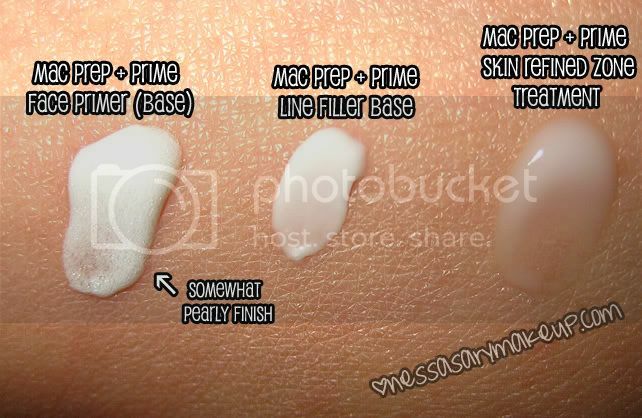 MAC Prep + Prime Line Filler ($19.50), described as "A primer used post-foundation, pre-makeup to camouflage, soften and relax expression lines and wrinkles. Applies as a dense cream: dries to a transparent, smooth, natural matte finish. With ongoing use, clinically proven to help rejuvenate your look." Translation: It's basically a primer for wrinkles, fine lines (such as under the eye, crows feet, frown lines around the mouth, etc) and invisibly "fills" these lines thus creating a smooth barrier for easier makeup application as well as minimizing the look of these lines by making them softer. In my Makeup Application Steps Post, I used the line filler under my eyes where I have a couple of lines (apply like you would an eye cream, pat or swipe a little dot), then apply your concealer > foundation for a flawless finish. As you notice in a few of the pictures from that post, my under eye looked really smooth and flawless after applying the Sonia Kushuk loose powder on top of the concealer, but it was the line filler that helped create the smooth canvas to begin with as well as keeping that delicate area moisturized. Overall: This is a "must-have" for me, I love using it under my eye so that my concealer and powder goes over it smoothly. Consistency wise it's thicker than the Skin Refined Zone Treatment and when dry, your skin feels smooth like a face primer with that powder-like feel. The good 'ol Prep + Prime Skin ($23), this has been around for awhile, and I like it A LOT better than the Prep + Prime Face Protect with SPF50 because it feels more like a primer, and less like a moisturizer which I love. It is described as "An ultra-fluid lotion formulated with special-effect silicones. Calms and soothes the skin, blots away excess oil, and evens out skin redness. Improves the laydown and application of foundation or powder." Translation: A basic face primer for the face, to be applied AFTER your moisturizer and BEFORE foundation application. It creates a smooth surface on your face so that your foundation goes on flawlessly without any blotches or uneven tones or color. Overall: This is one of the best primers I have used so far, it hasn't caused my skin to react in a crazy way, smells good, and is a lot cheaper than other primers I have tried. The best part is that it actually does its job. The primer itself is pure white and has an iridescent pearl-like shimmer or sheen to it, but does not show on your face, it's just completely a pure cream that dries to a matte finish. This is a great post. Thanks for sharing. I think I'm going to pick up the primer. I love prep+prime it's my hg primer. I really want the refined zone treatment since I have such oily skin and it sounds like it would work out great. Thank you for the reviews! Thanks for the review - I was on the fence about buying some of these, but I think i definitely will now! I'm really loving refined zone, I usually have a hard time finding something that handles oil control but doesn't make me break out. I've heard so many great things about the line filler, I must try it soon! Great review Vanessa! I love the Prep&Prime Skin;; it's my hg :) I'm glad that MAC is keeping the other ones permanent. That way we all won't be sad once they leave ! Hi Chels- the MAC Skin Primer is pretty good at controlling oil, I mean then again I have dry skin to begin with, so I can't really say how it would hold up with a person with oily skin, however I didn't notice any shine or that melty look I usually get with other primers (such as Smashbox's primer) where I LOOKED oily, so for me this primer just works great because it still holds my makeup well all day! Thanks for the awesome post - makes it easier for me to refer to them all in one post rather than 3 different ones. I need to try that line filler!!! thanks for the amazing post Vanessa! this may be a silly question but how are they in terms of pore minimization? Thank you so much for this review. I am definitely gonna get the Prep + Prime filler. I really need it for my eyes! I love the Skin Refined Zone!! I now come home with no oily T-Zone! I also want to try the line filler and the face primer sometime soon. thanks for the review! i've been wondering about the prep n prime foundation primer. love line filler...it really does work. Really want that line filler..
How does the Refined Zone compare with MAC Matte???? It sounds exactly the same to me. Your thoughts? Awesome review! I've been using the good ol' prep and prime for a couple years now and I love it! I was bummed out when they were out of the the Refined primer (initially wanted that) but bought prep&prime and I've been sold since ;) Now I'm glad you posted this blog so I'm not as curious anymore. THANK YOU for reviewing the primers! I'm definitely going to purchase the line filler and then the other primers eventually! Thank you for your post. Actually after reading the post i went to MAC and tried out the line filler (I have some lines under my eye) And the sales person told me that the line filler is NOT for the eye area... She didnt give me a reason and i am wondering your thoughts on it. Hi Theresa! How are you? I use it around my eye and mouth but personally I think it just comes down to use preference, since the line filler is similar to that of a primer (it's use as well as it''s ingredients and feel) I personally think it is safe to use around such area without causing any particular harm; and it works for me. At 26, I don't have any lines or wrinkles yet so my main area of concentration is similar to yours, where I have a line or two under my eyes and essentially would like the line filler to "fill" these lines so that my concealer and makeup can go on smoothly. MAC says the same thing about certain pigments because of the dyes it contains and I know many people still use it whichever way they see fit, although I don't personally use it where they say not to use it! LOL. But I think it's just based on prerogative....in case some harm goes wrong, they also don't want to be liable so I can understand their warnings. But like I said, it works for me...some makeup artists will say you CAN use it and some won't. I am not sure if you are LDS but either way I am loving that you put an LDS quote on your blog! great review, exactly what i was looking for, I am definitely going to pick up the line filler base. Hi I have all 3 products and use the line filler for lines smile and frown lines. I usually use moisturizer, then skin refine zone, then line filler, then primer. But I am still seeing my foundation get caught in my smile and frown lines and making them look worse. Any suggestions? Should I be using the filler after the primer? Maybe I'm not letting the filler dry long enough? Hi I just wrote you awhile ago... please email me your response @ miss_sarahg@live.com thank you! Great review! Thanks! But just to let you know, that quote you have above by Elder Russell M. Nelson is an LDS (Mormon) religious representative (I'm Mormon myself). When he is speaking about a "firm foundation" he is not talking about the makeup "foundation", but rather about a firm "base" in life. Not sure if you knew that so just thought I would pass it on. Love your website and your reviews are awesome!